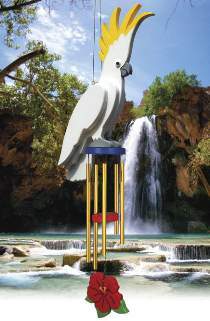 The cockatoo is a large parrot native to Australia and the East Indies. Make it from five layers of 3/4" stock. All patterns drawn FULL SIZE. Measures 20"H. Special #2083 includes the plan, the plastic eyes, the mid-size wind chime tube set and the wind chime string.